For other uses, see Cadet (disambiguation). A cadet is a trainee. The term is frequently used to refer to those training to become an officer in the military, often a person who is a junior trainee. Its meaning may vary between countries. The term is also used in civilian contexts and as a general attributive, for example in its original sense of a branch of a ruling house which is not currently in the direct line of succession. The term comes from the French term "cadet" for younger sons of a noble family. In Commonwealth countries, including the United Kingdom, a cadet is a member of one of the cadet forces. In the United Kingdom these are the Combined Cadet Force, the Sea/Royal Marine Cadets, Army Cadets and the Air Training Corps. Military officers in training are called officer cadets. In Canada, the term "cadet" refers to an officer in training, with the official rank names as Officer Cadet for the Air Force and Army and Naval Cadet for the Navy. It also refers to any member of the Royal Canadian Army Cadets, Royal Canadian Air Cadets or Royal Canadian Sea Cadets. These three organizations are volunteer youth groups administered by the Department of National Defence. In Germany, the rank Cadet (German: Seekadett) only exists in the German Navy for officers in training. In the Army and the Luftwaffe, officers in training usually have the rank of a Fahnenjunker or Ensign (German: Fähnrich) before they are promoted into the rank of a Lieutenant. In the Philippines, the term cadet is used in mostly military attached organizations, but it is more distinctive in the service academies of the Philippines, such as these are the Philippine Military Academy (PMA), the Philippine National Police Academy (PNPA), and Philippine Merchant Marine Academy (PMMA). Graduates of these service academies, are automatically given officer commission in the Armed Forces of the Philippines, the Philippine National Police, Philippine Coast Guard, the Bureau of Fire Protection, and Bureau Of Jail Management and Penology. Graduates of PMMA are given reserve officer status in the Philippine Navy and mostly go to private shipping firms. The term cadet is also applicable to the enrollees of Citizen's Army Training (for high school) and Reserve Officer Training Corps (for college). Service academy cadets are thought to be between the NCO and Officers ranks, and NCO consider cadets as rank higher to them. Punishments for the cadets depends on their violations. If a cadet violated the rules and regulations of Philippine Military Training and the rules of the school itself, the cadet will get punished by either doing push-ups, pumping, or squat. In Ireland, a Cadet is a pupil of the Military College, which carries out officer training for the Air Corps, Army and Naval Service. Training takes two years and the Cadets are split into Senior and Junior Grades and Classes. In Norway, a "cadet" is a pupil of either of the three Krigsskolen ("war schools"), which educate commanding officers for either the Army, the Navy or to the Air Force. In the United States, cadet refers to a full-time college student who is concurrently in training to become a commissioned officer of the armed forces. Students at the United States Military Academy, the United States Air Force Academy, and the United States Coast Guard Academy respectively hold the rank of Cadet, United States Army; Cadet, United States Air Force; and Cadet, United States Coast Guard, while students in the Army Reserve Officer Training Corps (AROTC) and the Air Force Reserve Officer Training Corps (AFROTC) respectively hold the rank of Cadet, United States Army Reserve; and Cadet, United States Air Force Reserve. In contrast, students at the United States Naval Academy and those enrolled in the Naval Reserve Officer Training Corps (NROTC) at civilian colleges and universities are referred to as "midshipman" (plural: "midshipmen") vice cadet and hold Midshipman rank in the United States Navy and United States Naval Reserve, respectively. Students at the United States Merchant Marine Academy and the preponderance of students at the Maine Maritime Academy, the Massachusetts Maritime Academy, the California Maritime Academy and the State University of New York Maritime College, though called cadets at their respective institutions, actually hold the rank of Midshipman, United States Merchant Marine Reserve, United States Naval Reserve. Some state-sponsored military colleges, including The Citadel, Virginia Military Institute (VMI) and private military college, Norwich University (NU), refer to their students as cadets. In Australia Cadet also refers to an officer in training. The official rank is Officer Cadet (OCDT for members of the Australian Regular Army and OFFCDT for members of the Royal Australian Air Force) however OCDT's in the Royal Military College—Duntroon are referred to as Staff Cadet (Scdt) for historical reasons. In the British and Commonwealth (formerly Empire) as well as Russian service, these groups of boys or youths are organized, armed and trained on volunteer military lines. The Antigua and Barbuda Cadet Corps consists of students between the ages of 12 and 19. It Is a voluntary youth organization, sponsored by the government and people of Antigua & Barbuda that acquires its membership from the Secondary School. The main objective is to provide training and personal development to the youths through paramilitary activities and also embrace community activities. The training is geared to inspire young men and woman to become model citizens. Emphasis during training is often based on discipline, loyalty, leadership and good citizenry. Presently, the cadet corps has 200 active members and falls under the direct command of Colonel Glyne V. Dunnah, a regular officer of the Antigua and Barbuda Defense Force (ABDF), and is a part of the ABDF. [not specific enough to verify] There are two categories in the Cadet Corps: Sea Cadets and Infantry Cadets. Ranks start from Recruit—WNCO. In Australia, a "cadet" can be a person aged between 13 and 18 who is a member of the Australian Defence Force Cadets (ADFC). The ADFC is composed of the Australian Army Cadets (AAC), Australian Navy Cadets (ANC), Australian Air Force Cadets (AAFC), which are funded by the Australian Government via the Department of Defence. Other cadet movements include the St John Ambulance Cadets (Operations Branch), and the South Australian Country Fire Service Cadets. The longest running cadet corps in Australia is The King's School Cadet Corps. In Austria-Hungary, the cadets of the Austro-Hungarian Army (1867–1918) wore the Feldwebel rank insignia on the gorget patch. The characteristic of the cadet ranks was the so-called distinction-galloon on the sleeve ends. It was similar to the feldwebel-galloon, however, from gold colour instead of emperor-yellow. The particular rank was added as well. In Bangladesh, the students of cadet colleges, MCSK (Military Collegiate School Khulna) and who are volunteering Bangladesh National Cadet Corps are called cadets. The students of Bangladesh Marine Academy are also called Engineering Cadets or Officer Cadets. The recruits of the Bangladesh Army, Bangladesh Navy and Bangladesh Air Force are called Gentleman Cadets(GC). There are 12 cadet colleges in Bangladesh, nine for men and three for women. Faujdarhat Cadet College is the first cadet college of the country, established in 1958. In addition, the students of MCSK (Military Collegiate School Khulna), an English version educational institution under the direct supervision of Bangladesh army are also addressed as cadets. It has an administrative structure as like the other regular cadet colleges and trains its cadets with primary paramilitary training. Voluntary members of Bangladesh National Cadet Corps (BNCC) are also called cadets in Bangladesh. They promote youth development movements in Bangladesh. Bangladesh National Cadet Corps (BNCC) is a voluntary organization for teachers and students. It is one of the oldest organisations in Bangladesh. It started its operation in the Indian sub continent in the year 1923 as University Officers Training Corps (UOTC). During the Bangladesh Liberation War, cadets of this organisation played an important role as freedom fighters, with a number of casualties. The cadets aspire to show the same devotion. This is one of the most motivated forces existing in Bangladesh, operating under the dual administration of the Ministry of Defence (MoD) and the Ministry of Education (MoE). Its main objective is to develop leadership qualities, sense of dedication and patriotism among the members through military based principles. Another mission is to prepare a 2nd or 3rd line of reserve forces having the capabilities to operate with the regular armed forces to counter any emergencies or in the wake of external aggression. Bangladesh National Cadet Corps (BNCC) is the apex organisation that provides Voluntary Military Training (VMT) to the students of as BNCC cadets to build good character and attempts to instil dedicative, patriotic and leadership qualities. In military academies, cadets are trained in isolation to make them efficient military leaders to lead the soldiers of the Bangladesh Armed Forces as officers. But BNCC cadets are basically students of the universities, colleges and high schools who voluntarily join the corps to develop themselves as good citizens of the country and also enjoy the incentives provided by BNCC. Cadets take military training voluntarily twice a week during school hours within the premises of their respective institutions and some intensive training during the Annual Training Exercise and collective exercise with the Bangladesh Armed Forces. The Canadian Cadet Organizations comprise the Royal Canadian Sea Cadets, the Royal Canadian Air Cadets and the Royal Canadian Army Cadets. The program is sponsored by the Canadian Forces and funded through the Department of National Defence (DND) in partnership with the Army Cadet, Air Cadet, and Navy Leagues of Canada. The term Cadet Movement applies when speaking of everyone associated with the program including the CF, DND, Leagues, Community Sponsors, Cadets, and parents and guardians of cadets. The Royal Canadian Mounted Police used to maintain police cadet partnership with Scouts Canada called the RCMP Rovers and Ventures; however, it has been re-constituted into the RCMP Stetsons and Spurs and is run by various RCMP detachments. St. John Ambulance in Canada supports a youth division that includes "cadets". Although cadets in other countries may have to take part in the military in their country, cadets in Canada do not have to join the Canadian Armed Forces. The Canadian cadet organization is the largest youth organization in Canada and the largest Cadet group in the world. Its core aims include. 1) Developing in youth the attributes of good citizenship and Leadership. 2) Promoting physical fitness. 3) Stimulating an interest in the Canadian armed forces. Each branch of the Cadet organization (army, air and sea) share some of the same training, but they also complete specialized training that corresponds with that element. For example, Air cadets' complete training includes planes, V.O.R's, and gliding. Army cadets complete training including abseiling, hiking, fieldcraft, camping, biking, knots, shooting, map and compass and many others. This program provides youth between the ages of 12–18 opportunities including friendship, important life skills, and a chance to travel throughout Canada and the world. The cadet program is free. The oldest operating cadet corps in Canada is the Bishop's College School #2 Cadet Corps in Lennoxville, Quebec. The Prussian military system created a caste of gentlemen-cadets called Junkers (from Jung Herr, "Young Lord"). Their family would receive a title and a land grant in exchange for service in the Army. When their sons became of age (about 14 or so), they would be sent off to either a military academy (Kadettenschule) or apply directly to a regiment. Both required that the candidate be sponsored by a colonel or general, come from a respectable family, have the means to support their livelihood, and have no outstanding debts. New cadets were classed as a Fahnenträger ("Flag-bearer") if they had already attended an academy or Offizier-Aspirant ("Officer Candidate") if they had not. Later the title was changed to Portepee Fähnrich ("Cadet with lanyard"); they received the right to wear a senior NCO's lanyard knot on their service dagger. After six months to a year, they were promoted to Fähnrich (en: Officer cadet). They were later renamed Degen Fähnrich ("Sword Officer cadets"), who received the sword of an officer. They were considered probationary officers. The officer cadet was allowed to eat in the officer's mess and have a Offiziersbursche (enlisted servant). After a probationary period the officer cadet would submit a request to be commissioned. The officers of the regiment they were assigned to would vote on whether they deserved a commission. Those who passed the vote would have their names submitted by their colonel to the Kaiser, who would approve their promotion to Leutnant (OF-1). A series of reforms in 1899/1900 led to a change in the system. The rank of Fahnentrager was changed to Fahnenjunker. They had to pass an exam to be promoted to Fähnrich. They are now funded by the Hong Kong government and has no ties to either the British Forces or the PLA. The Cadet Force came into being on November 1, 1943, and was then known as the Army and Air Cadet Force. The first Commandant was Colonel (then Major) Michael Ralph DeCordova, M.B.E., who evolved the organization, rules and regulations and also designed its badge. At the end of 1943, sixteen (16) Cadet Units were formed in Secondary and Technical schools. The fifth and tenth anniversaries of the Force were celebrated by special parades held at Knutsford Park (now New Kingston) in 1948 and Up Park Camp in 1953. The Force Standard, donated by parents of cadets and by ex-cadets, was presented at the Tenth Anniversary Parade on November 26, 1953. On April 12, 1954, the Force received a great honour. The Mayor and Corporation of Kingston awarded it the Freedom of the City and its symbolic “Key”. Advantage is occasionally taken of this high privilege and the force marches through Kingston with fixed bayonets. From as early as 1944, efforts were made to start an exchange of Cadets between Canada and Jamaica. From 1962 to 1972 the annual camp was at an international level, attended by officers and cadets from Canada and, from other Caribbean territories with air cadets from the United States participating on one occasion. A group from Jamaica attended the camp of these countries in exchange. This was possible through co-operation of the Canadian authorities and the Royal Canadian Air Force. On one occasion the Jamaican Defence Force Air Wing flew five (5) cadets to the Southern Caribbean. Col DeCordova relinquished command in 1963 and was succeeded by Lt. Col W. R. Goldsworthy. The rank of Honorary Colonel (of the Cadet Force) was bestowed on Col DeCordova and in 1966 he received the honour of C.B.E. (Commander of the Order of the British Empire) from Her Majesty the Queen. Lt. Col Goldsworthy resigned in 1964 because of ill-health and was succeeded by Lt. Col A. N. C. Ince JP, who left Jamaica for several years and was succeeded by Lt. Col M. K Nunes Lt Col Nunes became the fourth (4th) Commandant of the Force in 1969 and relinquished command on November 25, 1991. He was succeeded by Col S B Francis the Fifth (5th) Commandant of the Force. Col Francis relinquished command on January 30, 1999 and is succeeded by Col Lemuel Augustus Lindo the sixth Commandant. With the introduction of Seamanship training, the Force’s name was changed to the "Jamaica Combined Cadet Force" in 1967. Originally, the Force was under the control of the Ministry of Education, but was transferred to the Ministry of Defence on the request of the then Prime Minister, The Honourable Sir Alexander Bustamante, who had always displayed a keen interest in the Cadet movement. When the office of the Prime Minister became a separate Ministry, the responsibility for the Cadet Force was transferred to the Ministry. Presently we are the responsibility of the Ministry of National Security and Justice, Defence Branch. The JCCF now consists of a moderate headquarters staff, sixty (60) post-primary schools. On September 17, 1988 HQ JCCF was relocated at the southern end of Up Park Camp, (De Cordova Barracks, named after its founder). The official opening was on December 10, 1988 by the then Governor General Sir Florizel Glasspole. In 1975, the Force was presented with a Cessna-150, aircraft registration number 6Y–JJK, by Air Jamaica. It is decorated in the colours of Air Jamaica and has the JCCF Crest painted on its tail fin. This acquisition has made the training of Cadets in aviation easier. On July 12, 1980, girls in co-ed schools were permitted to join units at their schools. On February 14, 1983, the Force provided a Guard of Honour at The National Stadium on the occasion of the visit of Her Majesty, Queen Elizabeth II and His Royal Highness, The Duke of Edinburgh. In 1985, the Force was presented with a Yacht, S/V China, to conduct Sea Training. In 2008, the JCCF celebrated 65 years of service to the youth of Jamaica with a major parade in Up Park Camp and several other activities to mark the occasion all over the country. In India, the National Cadet Corps is a voluntary cadet organization for motivating college students to pursue a career in the Indian Armed Forces. It aims to develop qualities of character, discipline, teamwork, leadership and adventure in the students. The corps organizes outdoor activities, such as camping, trekking, mountain climbing, etc. besides providing small arms training to cadets. Cadets have no commitment for serving in the armed forces, but are given a preference by the Services Selection Board when applying for officer commissions in the military services. Cadet is also used as a rank for those enrolled in military academies of India, such as the National Defence Academy, Indian Military Academy, Indian Naval Academy, Air Force Academy, Indian Coast Guard Academy or Armed Forces Medical College (India). These cadets are commissioned as officers in the respective service upon graduation, and make a commitment to serve. In the service academies of Indonesia which includes (Military, Naval, and Air Force) also with the Police Academy, cadets are called Taruna for military academy cadets, Kadet for naval academy cadets, and Karbol for air force academy cadets in Indonesian. Police academy cadets are also called Taruna. For recruits or trainee who are training to be soldiers or police personnel in the enlisted ranks, the term is called Siswa which literally means "student", it also refers to students who are studying in military high schools and other training institutions. In Ireland a cadet is a young member of the Order of Malta Ambulance Corps or the St. John Ambulance Brigade of Ireland and trainee army officers are cadets from DFTC. Another prominent cadet movement in New Zealand are the St. John Cadets who train in first aid skills and other important life skills. Pakistan has a strong line of cadet colleges overall the country. Cadet Colleges are special school system of the Pakistan Armed Forces that act as feeder schools for the services officer training academies of the Pakistan Army, Navy and Air Force. They are specifically intended to prepare young students from a very broad range of socioeconomic and linguistic backgrounds to pass the demanding physical, educational, psychological and behavioural standards of the Inter Services Selection Board (ISSB). This is distinct from the purpose of regular cantonment schools intended to educate the children of service members. The expansion of the Pakistan armed forces, and the broadening of the social base of its officers corps from the 1960s onwards has inevitably led to the expansion in the number of cadet colleges and their distribution around the country. In Singapore, there are three national cadet forces, the National Cadet Corps, the National Police Cadet Corps (NPCC), and the National Civil Defence Cadet Corps (NCDCC). Secondary school students who are members of these three organisations are called 'cadets'. In NPCC and NCDCC, the rank of Cadet is below the rank of Lance Corporal.For NPCC, Secondary One students officially attain the rank of Cadet at their Area's Swearing-In Ceremony. Cadets do not bear any rank insignia; however, the letters 'NPCC' and 'NCDCC' are at the bottom of the rank to differentiate NPCC and NCDCC Cadets from Singapore Police Force and Singapore Civil Defence Force personnel respectively. In Sri Lanka, there is one primary cadet force which is the National Cadet Corps (NCC). In recent years the NCC developed an Air Force Wing, a Naval Wing and a Police Wing. Western Cadet Bands and Estern Cadet Bands The National Cadet Corps (Sri Lanka) is the Sri Lankan military cadet corps and is a Ministry of Defence sponsored youth organisation in Sri Lanka. Formally the Ceylon Cadet Corps since 1881. It is open to high school students on voluntary basis and has a history of more than 126 years. The officers are teachers who act as instructors. The Cadets are given basic military training in small arms and parades.The officers and cadets have no liability for active military service but many volunteer to join the armed forces. South Africa has a long history of having cadets, with many schools having their own corps, however after the end of apartheid they were phased out. Cadets exist today, with some schools still maintaining their own unit. The Sea Cadets are also still in existence. In Commonwealth countries, including the United Kingdom, a cadet is a member of one of the cadet forces, which give military training to people of school age, while an officer cadet is a person undergoing training to receive a commission in one of the armed forces, for instance at the Royal Military Academy Sandhurst or the Britannia Royal Naval College. In the United Kingdom the government funded cadet forces are the Sea Cadets, Army Cadet Force, Royal Marines Cadets, Air Training Corps, Police Cadet Corps, and the Fire Cadets, each of which is a stand-alone youth organisation, and the school-based Combined Cadet Force. The Royal Marines Volunteer Cadet Corps and the Frimley and Camberley Cadet Corps, both formed in the early 20th century, were the forerunners to later government funded associations and still exist independently, uniquely offering cadet opportunities to younger cadets (7–18). St Aubyn's School in Woodford Green, London, is the only school in Britain to offer cadet activities to 8- to 13-year-olds within its own cadet corps. The Northern Ireland Fire and Rescue Service also offers a programme for aspiring Fire Fighters. At the next level of training there are university cadet forces—University Officer Training Corps (UOTCs), of which there are 19 across the country, University Air Squadrons (UASs), of which there are 14, and University Royal Naval Units (URNUs), of which there are also 14. They are designed to train university students in military leadership, to promote the military across universities and to increase civilian-military relations. Students are not committed to serve in the armed forces, but can gain qualifications and commissions through the organisations. Cadets can gain a Territorial Army (Group B officer) commission through a UOTC, an Acting Pilot Officer commission through a UAS, while URNU students hold the rank of Honorary Midshipman. Cadets also represent St. John Ambulance in the line of public duties and first aid. There are many competitions for cadets within the UK, for example the "Swift and Bold Competition", held at the London Oratory School, whose CCF still holds the name Royal Green Jackets long after the regular army and territorial army regiments have been amalgamated into The Rifles. The United States also has several youth cadet organizations. The Junior Reserve Officers' Training Corps is a youth citizenship program with units administered by either the Army, Air Force, Navy, Marine Corps, or Coast Guard in American high schools. One of the primary functions of the U.S. Air Force Auxiliary, otherwise known as the Civil Air Patrol, is to administer a similar cadet program training in elements of leadership, aerospace studies, and emergency services. There are other programs including the United States Naval Sea Cadet Corps and the Young Marines. The State of California also offers a Cadet program in middle and high school called the California Cadet Corps. For those who choose to enter a formal program to become an officer, Cadet is the rank bestowed on those in the United States Air Force Academy, United States Military Academy, the United States Coast Guard Academy and Army and Air Force ROTC; the equivalent rank for students at the United States Naval Academy, United States Merchant Marine Academy and in Naval ROTC is midshipman. Members of these programs will be commissioned in the military, with a term of commitment afterwards. In addition, students at a senior military college such as The Citadel, Norwich University, the University of North Georgia Corps of Cadets, the Virginia Military Institute, the Texas A&M University Corps of Cadets, and the Virginia Tech Corps of Cadets or U.S. Merchant Marine officer license candidates at any one of the six state Maritime Colleges are referred to as cadets—although they may or may not be enrolled in a formal officer commissioning program. Students at militarily structured preparatory schools, such as Culver Military Academy, Fishburne Military School, and others, are referred to as Cadets. A kursant (Russian: курсант), not to be confused to Cadet (ru: кадет / kadet), is a higher military college student, officer-student of the police, or a military trainee of the Russian Armed Forces. The term is frequently used as well in other countries of the former Soviet Union to refer those training to become an officer in the military, often a person who is a junior trainee or cadet (age below 17 years), for example in the Nakhimov Cadet Corps in Saint Petersburg. The kursant as military or police rank must not be confused with the "cadet" of the historical Russian imperial cadet corps. Today, the term kursant continues to be used in the Russian armed forces. The students of a military high school wear on their shoulder a strap to the uniform with the golden letter "K" for kursant. The term comes from the Russian word "kurs" (Russian: курс), which means a course of education. The term is used in civilian contexts, and in other national armed forces as well, but its meaning may vary between countries. The term was first used in the Soviet Union in 1917. It was introduced from 1945 in quite a number of countries occupied by the Red Army. In the Soviet occupation zone of Germany, the term kursant was also used as status description of an officer-student of the Volkspolizei and Kasernierte Volkspolizei. In early colonial history of Hong Kong, cadet was a system for training young Englishmen to be officials for Hong Kong, where they had to learn Chinese culture and sometimes Cantonese language and written Chinese in Hong Kong. Some cadets became major officials and even Hong Kong Governors. Later cadets were young policemen under training in the Royal Hong Kong Police Force. In the United States, cadet typically refers to an officer in training for the police, firefighter and EMT services. Some police and sheriff's departments employ cadets as non-sworn law enforcement officers, either before or after entering a training academy, to allow them to gain experience in law enforcement without becoming a fully sworn officer. They conduct various duties, similar to the UK's PCSOs, ranging from office work to parking and traffic enforcement. An example is the NYC police cadet corps, which is similar to an internship. 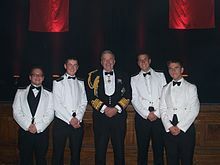 A recent example of Merchant Navy officers, graduating from cadets, at their 'passing out' ceremony from Warsash Maritime Academy in Southampton, with former First Sea Lord Alan West, Baron West of Spithead, in 2011. In the Merchant Navy, a cadet is an unlicensed trainee officer or engineer under training in much the same way as the military context. All Cadets receive training in firefighting, first aid and survival techniques. Cadets choose either one of two branches for professional development. Deck cadets train in the fields of navigation, shiphandling and cargo handling as well as maritime law. Engine cadets train to become marine engineers, electro technical officer, and as such their fields encompass a range of theoretical and practical engineering subjects, including Mechanical engineering, thermodynamics, control engineering, applied mathematics, welding and fabrication. Engineering practice is mostly learned during the cadet's assignment to a ship. The cadet training scheme differs from country to country, but the learning objectives are always the same. In the UK for example, cadets undergo training in a block-release format, spending a shorter time in college before going to sea for a short assignment after which the cadet returns to college. Other countries allow the cadet to finish his/her degree before going to sea, but most countries seem to prefer a system where a cadet completes all of his/her sea time before returning to college for the final year of their degree. Some sports teams also refer to players that are in the process of being built up to play for the team at a later date as cadets. Such players often play for a lesser team in the same club. This is done quite commonly in the National Rugby League (NRL). The Serie B, the second most important football league in Italy, is nicknamed campionato cadetto, meaning championship of the cadets. Cadet is also used in short track auto racing for the name of a category of cars. This division is usually an intermediate division that allows drivers to gain experience for faster classes in the future. This name has been used at race tracks in the Western PA/WV/Southwestern NY area and the GA/AL/SC area. In Australia, the term is also used to describe a person pursuing a career as a Chartered Accountant under the "Cadetship" program, designed to accelerate career progression for motivated students. The programs are offered to students finishing high school or currently undertaking tertiary studies in relevant courses by several Accounting firms such as the Big 4 accountancy firms (Deloitte, KPMG, PricewaterhouseCoopers and Ernst & Young), and mid-tier firms such as BDO and Grant Thornton. To refer to someone as a space cadet is to imply that they are "on another planet", i.e. foolish or unaware of their surroundings, for example, "That guy is a total space cadet." The phrase was inspired by science fiction author Robert A. Heinlein's juvenile novel Space Cadet. In The Bahamas, it is not uncommon to refer to upper primary or high school students job shadowing various professionals as cadets. E.g. teacher cadet, library cadet, police cadet, nurse cadet and technical cadets. ^ a b One or more of the preceding sentences incorporates text from a publication now in the public domain: Chisholm, Hugh, ed. (1911). "Cadet" . Encyclopædia Britannica (11th ed.). Cambridge University Press. ^ Antigua and Barbuda Defense Force. ^ "National Civil Defence Cadet Corps (NCDCC) / National Civil Defence Cadet Corps (NCDCC)". www.uniforminsignia.org. Retrieved 2018-11-20. ^ "National Police Cadet Corps". www.npcc.org.sg. Retrieved 2018-11-20. ^ Tayob, Abdulkader (24 February 1995). "Islamic Resurgence in South Africa: The Muslim Youth Movement". Juta and Company Ltd. Retrieved 24 February 2018 – via Google Books. ^ admin. "Cadets". greyhighschool.com. Retrieved 24 February 2018. ^ Sewell, J. "Frimley & Camberley Cadet Corps". www.cadetcorps.org.uk. Retrieved 20 March 2018. ^ Great Soviet Encyclopedia (1980). Volume 24. New York: MacMillan. p. 176. OCLC 310655220. Online community for cadets in UK! This page was last edited on 28 March 2019, at 17:23 (UTC).